The very best in SHUSWAP WATERFRONT properties with 185 Ft of beachfront, this custom built luxury home offers 5 full ensuite bedrooms! 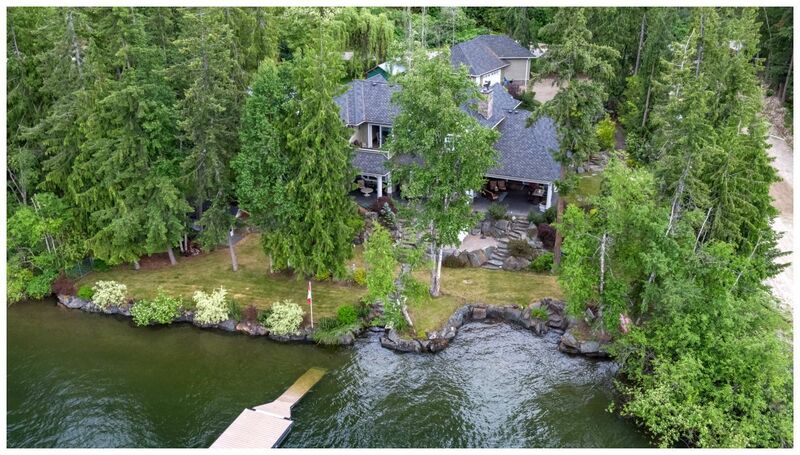 Set on a perfect 0.6 Acre private lakeshore lot fully landscaped with extensive use of rock retaining walls. Hands down the finest in quality craftsmanship this home shows like new. Huge central great room with FP & built-in cabinetry included wood ceilings & custom mouldings that extend in an open concept into the gourmet kitchen & dining room. The dining room offers wall to wall windows on all 3 walls w/double glass sliding doors that open onto the BBQ breakfast patio & the lakeside entertaining patio that includes another FP & projection TV w/remote screen & sun shades. The custom island kitchen offers full size gas range, walk-in butler's pantry, cabinet clad SS fridge, granite tops, feature mouldings & tiled floors. The main floor master suite offers his/her walk-in closets, a stunning 5 pce ensuite with dual head steam shower, corner soaker tub & dble sinks. Main floor also offers a full office off the entry foyer, a pwd room & dream laundry room with custom cabinets & counters including an island. There are extensive patios off all the rooms to enjoy the lake setting. Upstairs you will find a central loft with lakeview deck & 4 guest bedrms all with full ensuites that 3 of include steam showers too. The bedrms are huge & each have unique guest features such as kids bunk suite, sitting areas & walk-in closets. Includes huge floating dock, boat buoys & perfect swimming beach. Heating & A/C provided with 2 HVAC systems each with their own A/C units. There are also 2 HWTs and a deluxe water supply system with MonoDrive® constant pressure control system & double filtration with PuRoTwist® drinking water filters, Central vac system & deluxe stage 2 septic treatment system. The detached shop offers a full RV parking bay, parking for 5 vehicles or room for all your toys! Gated parking area adjoins side street with public boat launch right out your door. Take the quads, bikes or sleds right out your door to 100's of acres of Crown land trail systems. See our virtual tour and then call Rob for your personal viewing appointment today! 250-804-6288 local or 1-866-463-2791 toll free. SOLD@BIGRob.ca, Thanks for your interest!